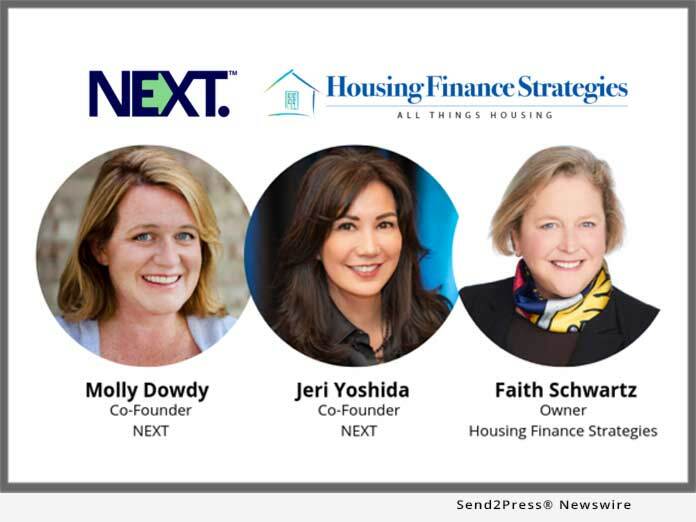 WASHINGTON, D.C., Apr 04, 2019 (SEND2PRESS NEWSWIRE) -- NEXT Mortgage Events, creator of NEXT women's mortgage technology summit, today announced it has engaged in a strategic alliance with Housing Finance Strategies, a Washington, DC-based advisory firm led by renowned industry veteran and award winner Faith Schwartz, former executive director of HOPE NOW. This alliance enables NEXT to establish a Washington, DC presence and expand its footprint into housing policy and regulations. It also allows Housing Finance Strategies to increase its visibility and reach among the NEXT community, which includes thousands of high-ranking women mortgage executives, and the organizations that support them. The companies plan to collaborate on a variety of projects that advance executives' industry knowledge of housing policy and regulations, and promote effective deal-making. "This collaboration avails a new level of intel to the NEXT community and puts a lot of power behind our growth plans," said Jeri Yoshida, co-founder of NEXT. "Housing Finance Strategies is respected across the housing industry for its expertise, and Faith is renowned for decades of noteworthy accomplishments. We're thrilled for the advances this collaboration will bring to the industry." "Having served as the keynote speaker at the NEXT Technology conference earlier this year on behalf of FormFree, I was enamored with the niche NEXT serves," said Faith Schwartz, Owner of Housing Finance Strategies, LLC. "The intersection of my consulting firm -- with clients ranging from big 4 consulting firms to non-banks and fintechs -- and NEXT is a tremendous fit and the timing with all the housing related issues in play is prescient." "NEXT is known for delivering the type of executive intel that changes business outcomes, as well as individual careers," said Molly Dowdy, co-founder of NEXT. "This strategic alliance will turbocharge what NEXT delivers as Faith and Housing Finance Strategies bring unrivaled thought leadership to the NEXT community on a consistent basis." The two firms will continue to operate their businesses and corporate entities without a change in structure while leveraging the benefits of the alliance. In January 2018, NEXT Mortgage Events broke the mortgage industry's unspoken barriers that limit women's access to competitive intel and networking-based information exchange, when it introduced NEXT, the mortgage technology summit for women. NEXT is a two-day, tech-focused symposium based on lenders sharing competitive intel with other lending executives. A boutique gathering, each NEXT event is limited to 200 attendees, and targets a select group of decision making executives. Roughly 85-90 percent of lender attendees hold a title of VP or higher and approximately 85 percent of attendees are women. NEXT is held twice a year, in winter and summer. For more information visit NEXTMortgageConference.com, follow @NEXTmtgEvents or email info@NEXTmortgageEvents.com. Housing Finance Strategies is a small woman-owned business founded in 2016 to provide Strategic Advisory Services, Government and Industry Relations, Public Policy Expertise, Roundtable and Event Management and Professional Speaking Services. The firm brings 25+ years of expertise to the forefront of mortgage, including leading fintech change, advising on GSE reform and ensuring non bank readiness for regulatory oversight. For more information, visit HousingFinanceStrategies.com or email admin@housingfinancestrategies.com.